Today, the ASF received yet another complaint from a distraught individual who had, in their opinion, received spam from the Apache Software Foundation. This time, via our Facebook page. As always, this is because someone sent email, and in that email is a link to a website – in this case, www125.forcetwo.men , which is displaying a default (ie, incorrectly configured) Apache web server, running on CentOS. This distraught individual threatened legal action against the ASF, and against CentOS, under FBI, Swedish, and International law, for sending them spam. No, Apache didn’t send you spam. Not only that, but Apache software wasn’t used to send you spam. Unfortunately, the spammer happened to be running a misconfigured copy of software we produced. That’s the extent of the connection. Also, they aren’t even compentent enough to correctly configure their web server. It would be like holding a shovel company liable because someone dug a hole in your yard. Or, better yet, holding a shovel company liable because someone crashed into your car, and also happened to have a shovel in their trunk at the time. We get these complaints daily, to various email addresses at the Foundation, and via various websites and twitter accounts. 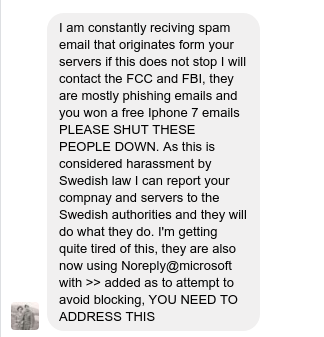 While I understand that people are irritated at receiving spam, there’s absolutely nothing we can do about it. And, what’s more, it’s pretty central to the philosophy of open source that we don’t put restrictions on what people use our software for – even if they *had* used our software to send that email. Which they didn’t.